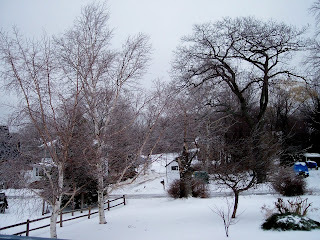 Oh well, just another March Maine day of snow, sleet, freezing rain, rain and a consistent Nor'east wind. So much for mud season for a couple of days. 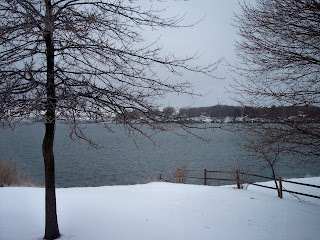 Lots of snow last night along with lots of wind and quite low temps. 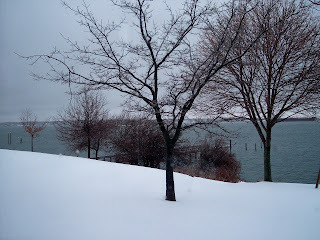 Of course, by this morning the temps had risen, the snow had changed to freezing everything (sleet, rain, hail et al) and the shoveling needed both a pick ax and a crane to get through the frozen drifts. Two weeks until Opening Day; can't get here soon enough. Today is just a big "Whatever" day. 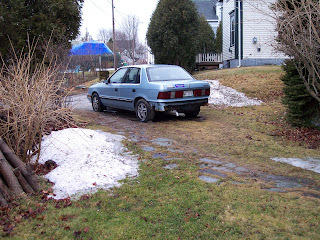 By Tuesday, we'll be back into mud so take a slow day, read a book under the covers and watch a movie or a little hoops. It's a good do nothing day. Enjoy those while you can. Finally, the big meltdown is underway. It's the classic good news-bad news scenario. The days are warmer, the walking can begin and the loss of a layer or two of clothing can finally happen without frozen limbs resulting. The bad news is the appearance of mud, the sinking of your car and the everpresent drying mud that follows you into your house. Oh well, at least it's not snowing today; maybe tomorrow, but not today. The sun hasn't made an appearance recently but the temps have been in the 40's the last few days and even made it over 50 last Sunday. The back of Winter has definitely been broken. I even saw my first Lincoln touring car complete with Mass. plates come rolling off the boat over the weekend----sigh!! I even saw my first pair of doves last week hanging around the yard; now, that was a very good day. With an occasional inning or two of the Red Sox games in spring training coming our way, the true Spring cannot be far behind. Now, if we can only get those huge puddles and fields and roads of mud dried out, life will certainly become very good. 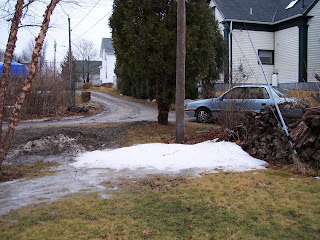 Here's a couple of pics from our back yard showing the declining pile of snow and the sea of mud up our street. With a little wind and a little sun, Peaks will definitely bloom forth; it's not long now!!! !